Vaseline petroleum jelly has been in the family for years,mum would use it and now we do.Great for dry skin or chapped lips and it makes a great heel balm! Vaseline has always been a staple item in my bathroom cabinet – it is a great product as it has so many different uses around the home as well as medicinal type usage. I can even recall it being in my grandmother’s home, it has been around for many many years. I always have a tub of Vaseline around the house. I use for dry lips or my son gets redness around his mouth from eating certain foods – Vaseline clears it up right away. And I discovered a new hack – my kids play winter sport and I have been slathering them in Vaseline because it blocks the wind and keeps them warm. Have now got the whole girls footy team using! I love Vaseline for all my beauty needs. It’s great as a lip balm but also awesome as an eyebrow tamer or even a cuticle cream. Many uses! I love how easy it is to access this product as you don’t have to squeeze and tube or anything to use it. Additionally, unlike most recent Vaseline products which are full of (delicious but unnecessary) scents, the petroleum jelly is unscented and natural! Vaseline has been around for years and has many many different uses. For the skin as well as for helping squeaky doors, or trying to get your rings off! it is a good size and the lid is easy to to take on and off for anyone. Vaseline is another one of those products that has been around forever (seems like!). Vaseline is so reliable and effective for so many purposes and we always have Vaseline in our pantry, bathroom, kitchen kit and first aid kit. Such a versatile product, so simple but so good. Great for chapped lips and skin. We always have a tub of this handy in our house. My mum used it on us when I was a child, for dry lips and really dry skin, And I have used it with my girls. It was and still is just petroleum jelly with no added chemicals. One star less because it does not come from a renewable resource. Always have one at home. one in the caravan. And one in toiletry bag. My daughter bites her lips at times and end up cracked and near bleeding so get out the Vaso. Dont even bother with Lip Balms because the Vaseline nourishes and soothes 10 times better than they could ever do. 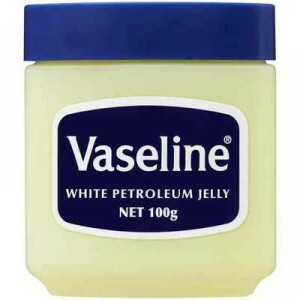 How would you rate Vaseline Petroleum Jelly?